I had some french-like bread left over from yesterday, which was part baked so I treated myself to a range of dips/spreads to eat with it for lunch. 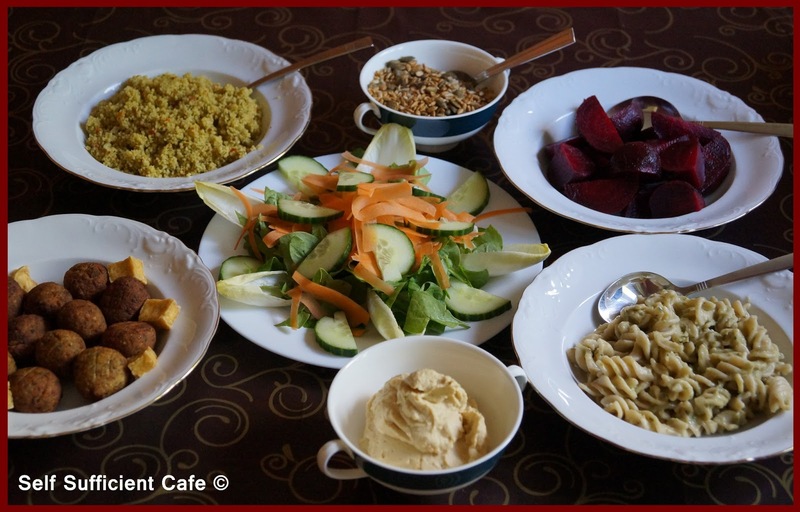 I've never really had a success with making baba ganoush at home, but after eating it at a local restaurant (the vegan and vegetarian night) I was tempted to give it another try. To make it a little sweeter I added some roasted red pepper to the blender. The verdict, not bad, but could do better, I'll have to work on the recipe before I post it. It was a little on the bitter side, I thought that these days there was no need to salt your aubergines but maybe I am wrong, its back to the drawing board for that recipe. The red pepper houmous was lovely though, I made up a batch of my standard houmous and halved it and added 1½ roasted red peppers to one half and blended again. * This is a little tedious to say the least but so worth it for the extra creaminess it gives the dish. 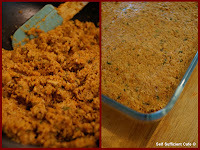 Blend together the skinned chick peas (drained, juice reserved), garlic, tahini, lemon juice, cumin and a little of the drained liquid. Blend to your desired consistency adding more of the reserved liquid as required. Add salt and pepper to taste and blend again. Halve the mixture and blend the roasted peppers with one half. Yay! My vegan swap box is here! I had to have it delivered again as there was no-one in to sign for it the first time it was delivered. It was the biggest box I had ever received, I was so excited to open it up but it was wrapped up so well, it took me 10 minutes to open it up and find the treasure! The hobnobs were opened first and I'm ashamed to say I scoffed almost half a packet in one sitting! 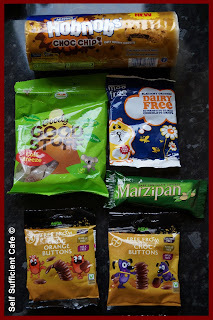 I like the original hobnobs too but the chocolate chip hobnobs were a welcome treat, I don't think I'll go back to the original hobnobs now I've tasted these! I've tried the ASDA choc buttons before and they're a nice addition to my lunch box every now and then. 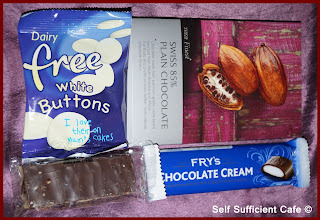 I've not tried the chocolate drops from Moo Free before but I have tried their chocolate and these were just as good. I bet they're also good for baking chocolate chip muffins! The Goody Good Stuff Cola Bottles are my favourites of favourites, I just can't get enough of these little beauties! My regular readers will already know that Tiger Tiger Mayo is my favourite, so that will be used often. I've not tried the nibl wasbi beans yet but if the wasabi crisps are anything to go by these are going to blow my head off! Can't wait to try them. I've been sent primal strips before but if I'm honest I've never been brave enough to try them. However the mushroom one has caught my eye and I shall try this with interest. I don't normally eat fake 'meats' (bar the occasional Linda McCartney sausage, strange I know but true) as I gave meat up for a reason and anything that looks or tastes like meat is a waste on me. But I am going to try the mushroom primal strip, I'm intrigued. After my review of shop bought vegan burgers I can't wait to try the organic vegetarian burger mix, Gary tells me this is a good one. In fact I may just make it up for tomorrows tea. Thank you so much Gary for all the goodies, it was by far the biggest and heaviest box I've received, and I will enjoy everything you have included. I hope you received a good one too! To see what I sent to my partner, Jade, please see yesterdays post. 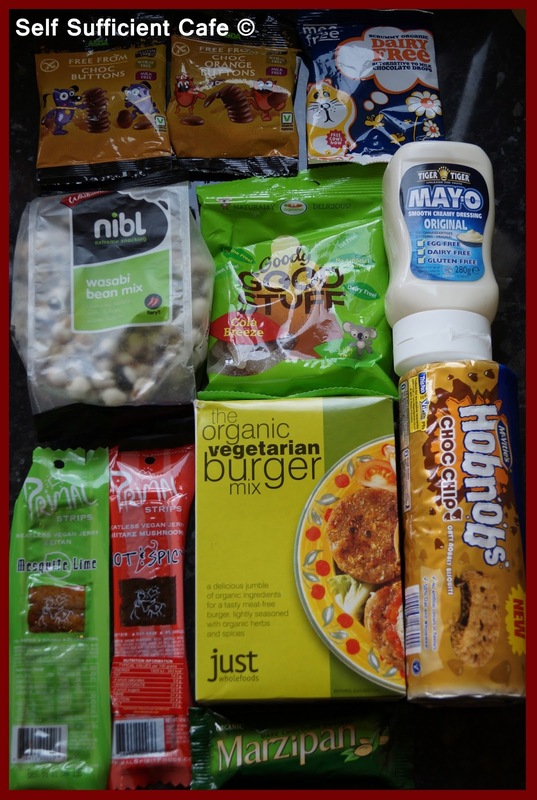 This is my 5th vegan food swap box month and I love it, this time I was sending to Jade and it was her first time, so I wanted to spoil her. Jade hasn't got a blog but she introduced me to bleat, which is a new vegan social networking site. I haven't joined yet, but I will, it looks like it could be fun. As you can see the box I made up was mainly sweet than savoury, so I hope Jade liked it. 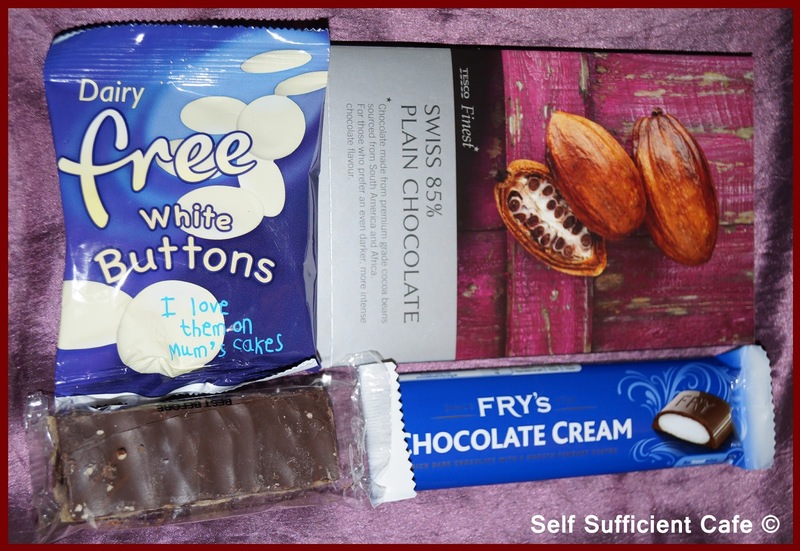 My very first vegan food swap box back in February contained a Frys chocolate bar and I was amazed it was vegan. That's why I love this idea, you get to find out accidental vegan foods without doing the homework. Since that first Fry's chocolate bar I haven't stopped. Trouble is Hubby likes them too and he nobbled the last one last night! More supplies needed! My favourite treat at the moment is the Hale and Hearty Deliciously Wholesome Date and Chocolate Flapjack. It really is delicious and I can't get enough of them at the moment. The Blackfriars flapjacks are also delicious but they are rather large. You could cut one in half and make two snacks. But I bet that it wouldn't be long before you went back for the second half because you know it's there! A bar of Panda liquorice is always in my drawer at work for those times when you need something sweet. Not all flavours are vegan though just the three pictured to the left. 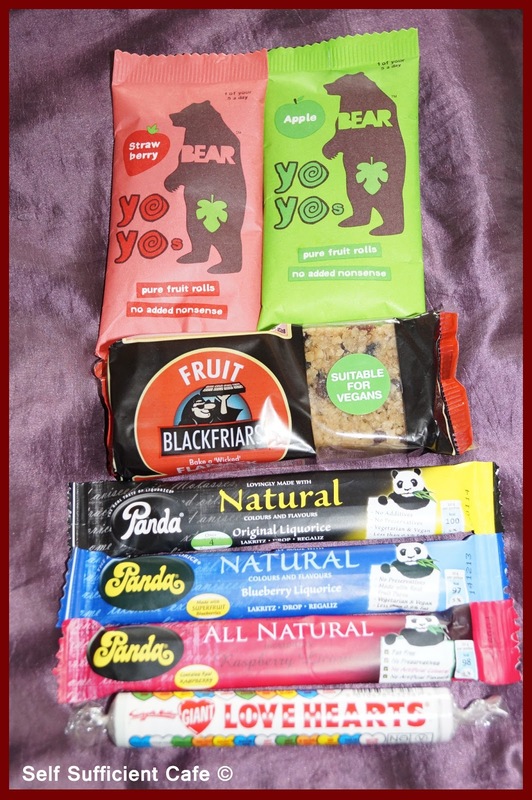 I found the Yo Yo Bear Fruit Rolls in my local co-op, I've tried the strawberry one and was pleasantly surprised but I've not yet tried the other flavours, I think there are 5 different ones. I couldn't leave out a packet of love hearts I think they're just so cute! Who else reads the message before eating? I read everyone! 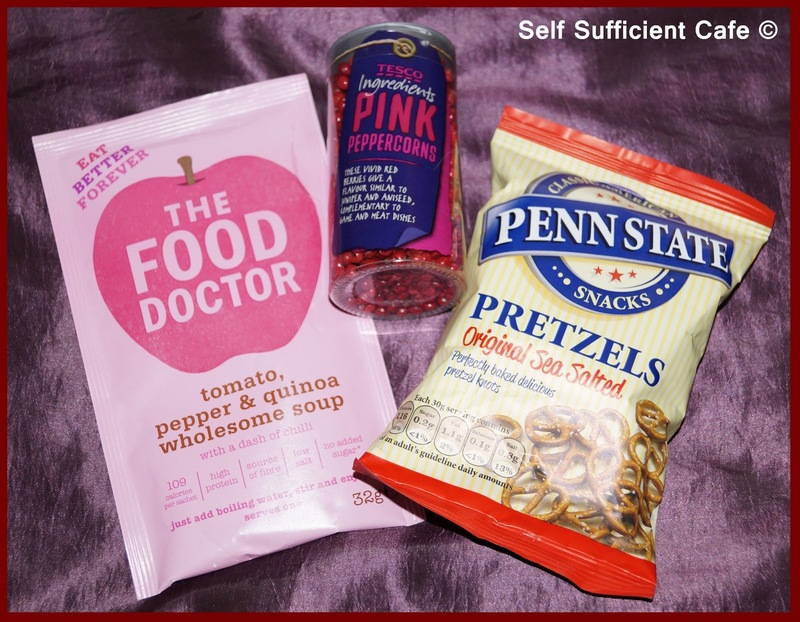 The only savoury items I added were the pink peppercorns, the pretzels and the soup. Jade advised me that she doesn't do "burn your mouth off hot" so I went with the pink peppercorns, hopefully there not too hot and they looked so pretty. I love the Penn State pretzels and these small packets just do the trick. 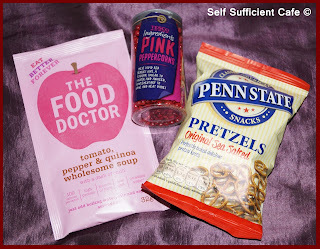 I've not tried the food doctor soup but I have tried the snack pot couscous by the food doctor, which was very nice. The small town where I live does not cater for vegans as such and it is extremely difficult to eat out. There is no vegan venue and most menus don't have a vegan option and if they do its not detailed. Whenever you want to eat out you have to give plenty of warning and explain what vegans eat. 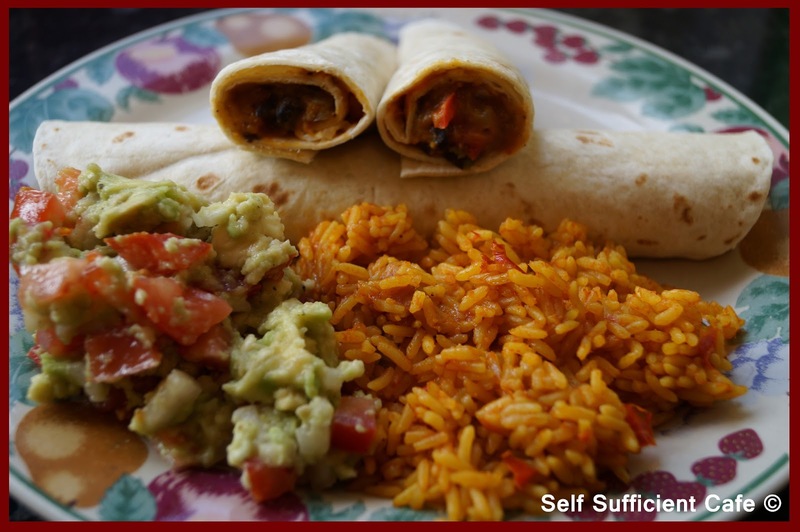 It gets a little tiring and when you know you can cook something tasty at home you start to forgo the option of eating out. Things have started to change in this small town and I'm starting to find out the options available to vegans. I'm intending to do a review of places to eat that are vegan friendly sometime soon. After what seemed hours of deliberating I decided on the risotto for my starter, followed by the local asparagus and breaded tofu dish for my main and to finish off my dining experience, I liked the sound of the roasted peach dessert. I emailed the restaurant back and couldn't wait to try the food. We arrived at the restaurant all dressed up and were shown to our tables. We were treated like princesses, it was an amazing experience. I was not let down by the food at all, it was exquisite. The presentation was out of this world and every mouthful was an explosion of flavours. After ordering drinks, confirming my choices and my friend choosing from their extensive menu we were presented with an amuse-bouche. Our waiter confirmed that mine was vegan and placed it infront of me advising that it was a sweet potato and mushroom soup. It was out of this world I couldn't wait for my starter. Unfortunately I didn't take any photos of the food (or anything else) as I was too excited to delve in as soon as the food was put on the table. You will just have to take my word for it! The starter was extremely tasty and the tender sweet peas, and baby broad beans complimented the mint perfectly. My main dish was an out of this world experience. I had no idea how the dish would look as the option just listed a range of foods but it was heavenly. The breaded tofu melted in your mouth and the breadcrumbs held so much flavour, the tomatoes and roasted peppers introduced a sweetness to the dish and this was complimented by the basil and pine nut pesto.The locally grown asparagus finished the dish of perfectly and the tips were like small treasures woven throughout the dish. This was served with baby new potatoes, tender green beans and mange tout. I didn't think the food could get any better but when the dessert arrived I think I went to heaven and back. I'm not really one for desserts I'm more of a savoury person but this dish stole my heart. The presentation of the dish was delightful and at first I didn't want to spoil it, but my taste buds could hang on no longer and I delved straight in. The roasted peach was baked to perfection and the cubes of raspberry gel melted in your mouth. The raspberry coulis and strawberry sorbet were a perfect match with a hint of garden mint. Overall I couldn't fault the food or service and we had a fantastic night catching up. I will definitely return I just hope it's soon! If you live near by you must go and experience the food, its worth it! Its been a few days since I posted, but I'm not ill again thank goodness, I've just been really busy, but more about that later. As you know from the previous two posts I had roasted a butternut squash and made some black bean burgers and I still had 1 burger left and some left over butternut squash. As I'm not one to waste food I needed to use these left overs up. 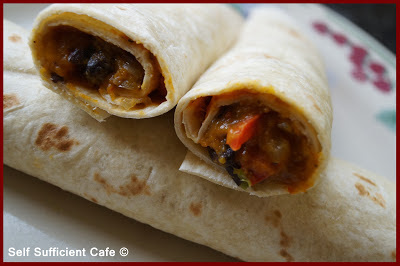 So last Thursday I decided to make a wrap for lunch. I mashed the butternut squash and spread it on a tortilla, I crumbled the blackbean burger over the top and added a squirt of sweet chilli sauce and some garlic mayonnaise and wrapped them up. They were delicious! 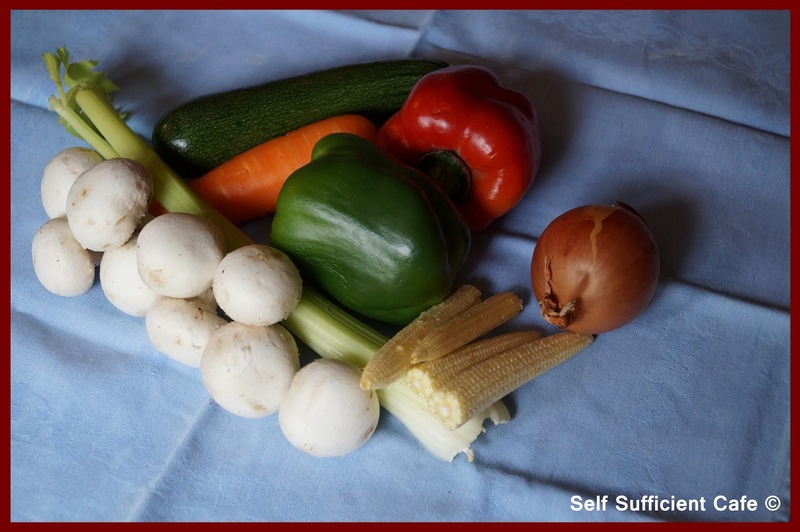 My vegetable supplies were getting low after the shopping I did almost a week ago. But I reckon they will last at least another 4 days with store cupboard ingredients. I still hadn't used the butternut squash, so I peeled, deseeded and cut it up and popped it in the oven to roast, which intensifies its sweet flavour. All I had to do was decide on what I was going to do with it once it had roasted. 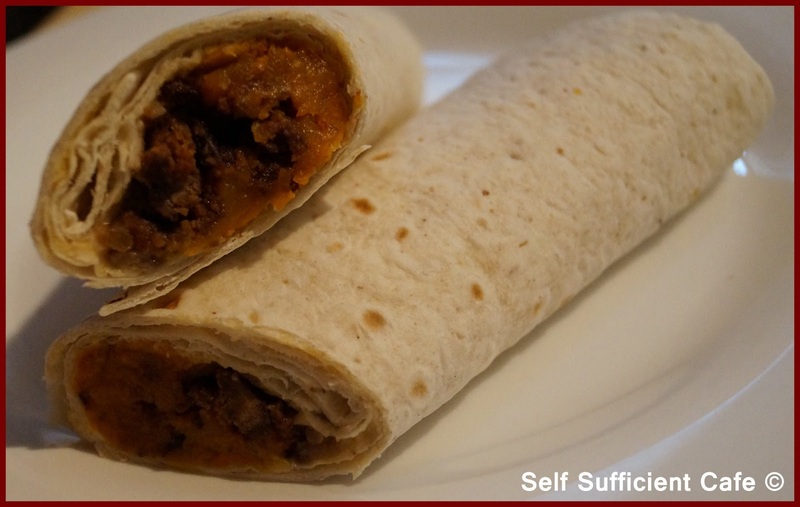 I'd tried Angela's roasted butternut squash and black bean burritos before, which were tasty so I thought I'd try the same combination in a fajita and it worked. 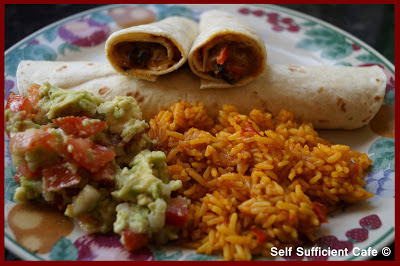 I served the fajita with Mexican rice and homemade guacamole. I was stuffed! This morning I fancied a smoothie, the sun was sort of shining and my blender had rested for over a week, so I thought it was time to put it back into action. 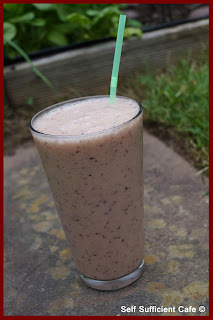 I checked what fruits I had on hand and came up with a Blueberry and Pinapple Smoothie, which was delicious, even though my blender couldn't handle the blueberry skins. 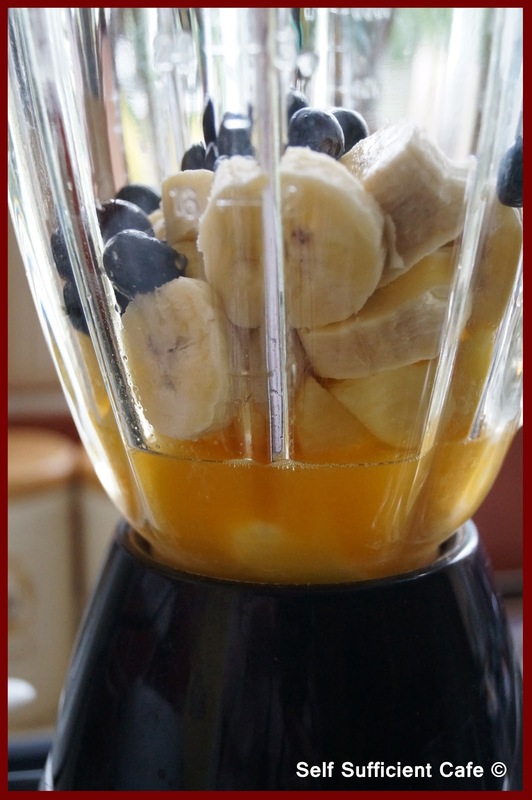 Squeeze the orange and add the juice to the blender, then add the pineapple, banana and blueberries. Blend, adding a touch of water if needed to get everything going. Oh one day I dream of owning a Vitamix! Today, we all had lunch at Mum and Dad's house to celebrate Fathers Day. To make life a little easier on my Mum, I made my vegan lunch and took it with me. 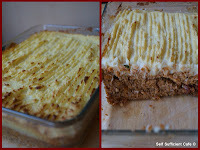 I had such a success with my Soba Veganaise, a vegan version of Spaghetti Bolognaise, I decided to use a similar process and make a vegan Sherperds Pie, which I'm calling Gardeners Pie. I've been hearing a lot about rice cauliflower, it's all over the internet and I'm dying to make a recipe using it but today I used cauliflower as one of the main ingredients, in my pie. In fact I used a whole head of cauliflower and this amazing vegetable features in both the 'meaty' filling and the creamy potato topping. I'm going to be experimenting a lot more with this vegetable it truly is a versatile veg! While the potatoes and cauliflower are cooking add the onion, celery, carrot and courgette to a food processor and process until finely chopped, but not pureed. Heat the olive oil in a large pan and add the mixture to the pan. Saute for 5 minutes stirring all the time, if the mixture starts to stick add a splash of water. Put the remaining half of the cauliflower in the food processor and pulse until finely shredded, it should resemble small grains of rice. 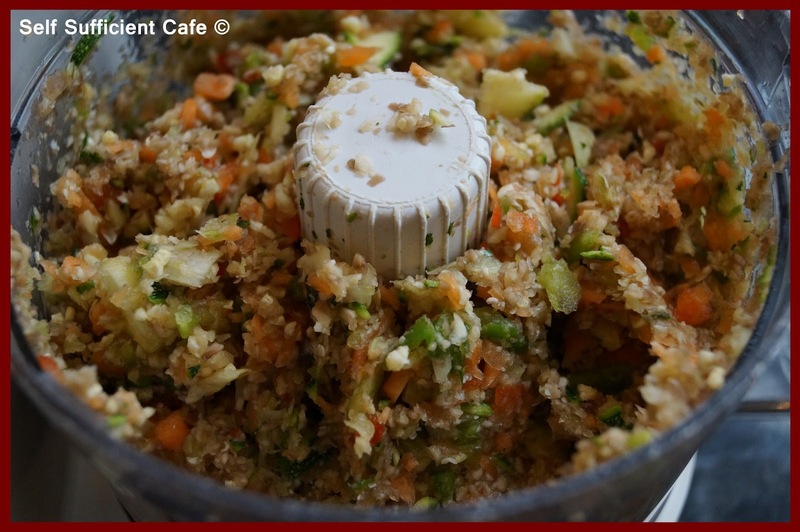 Hence all the cauliflower rice recipes out there!empty the contents of your processor into a bowl and set to one side. 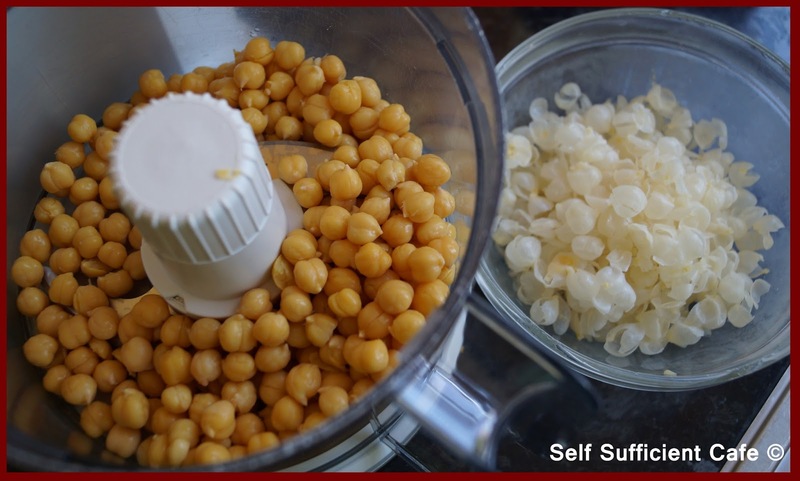 Put the chick peas in the processor and pulse until finely chopped, you don't want to make houmous here you want some texture. Next add the Worcester sauce, spices, shredded rice and chopped chick peas to the pan and stir to combine. Heat through for another 3-5 minutes over a low heat, stirring regularly. Add the nuts to the food processor and pulse until finely chopped, be careful, if you have a powerful processor it may process the nuts to a paste. Add to the pan with the balsamic vinegar and stir through. Transfer the mixture to an oven proof dish and top with the potato, cauliflower and nutritional yeast mash. Spread evenly using a fork to give a ridged effect. 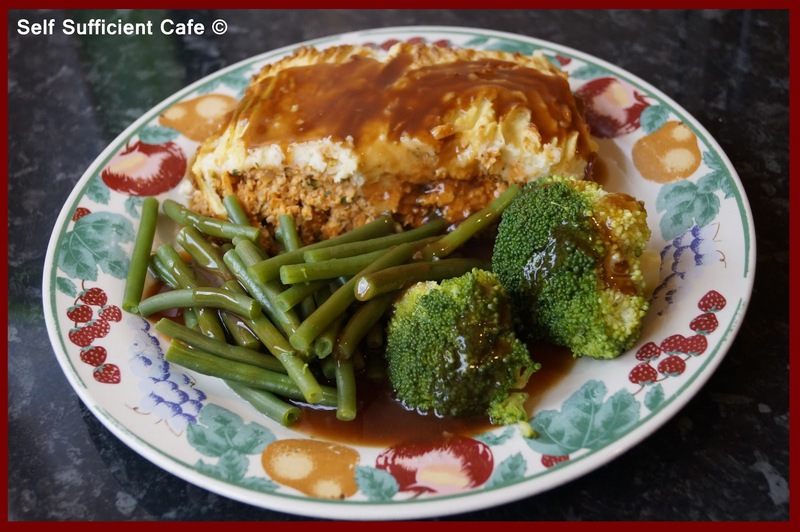 Bake in a moderate oven for 20 minutes or until the mash potato starts to brown in places. Serve with a selection of green vegetables and enjoy! 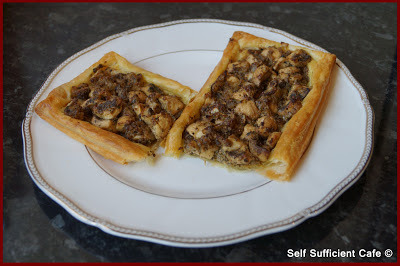 Both my Mum and sister tried a little piece and both said it tasted good - result! * You could use a whole tin of chickpeas if you want, but I made houmous with the other half! I hadn't caught up with my sister in ages because I'd been poorly and the last thing she needed was to catch anything I had whilst she was recovering from Guillain Barre Syndrome. But today she and Mum came for lunch. It was such a beautiful day (between downpours) and we decided to eat al fresco. I absolutely love eating outdoors when the weather is warm enough, it really does make you feel like you are on holiday. We were lucky enough to miss the showers, but just after we cleared up the heavens opened! The spread I put on was a simple but tasty variety of vegan food and included some french-like bread spread with vitalite, a gorgeous garden salad put together by my sister, falafels, Mediterranean couscous (yep another packet was lurking in my cupboard), toasted seeds, beetroot and a trio of dips. 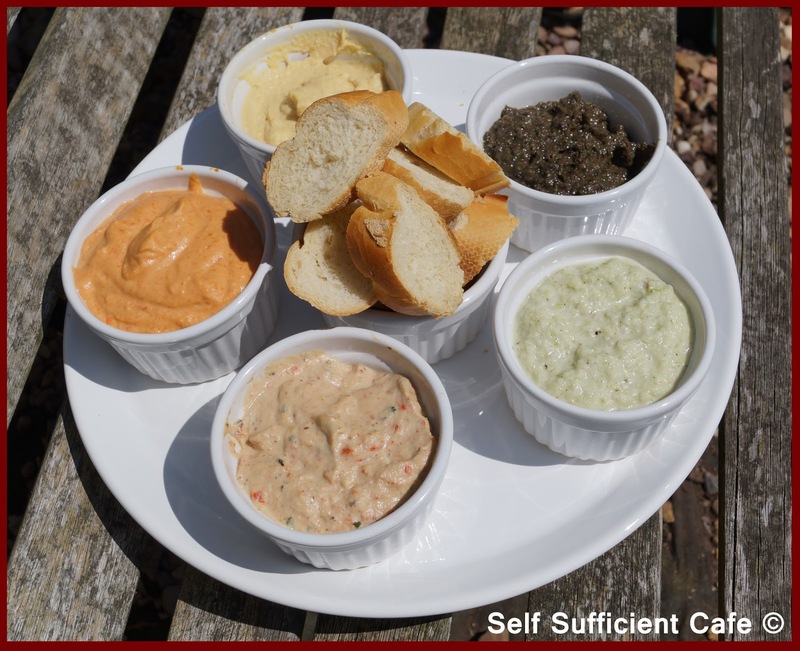 The dips I chose were houmous (of course), olive tapenade and creamy celery. Recipes below. 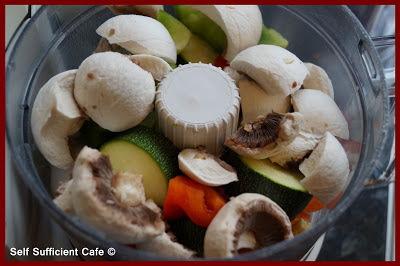 Put everything into a food processor and blend to a paste. 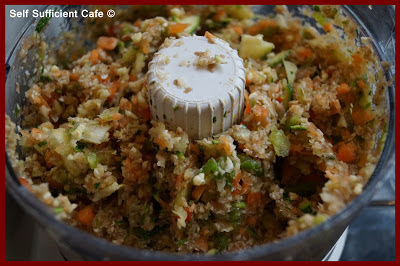 Put everything into a food processor and blend to a paste. 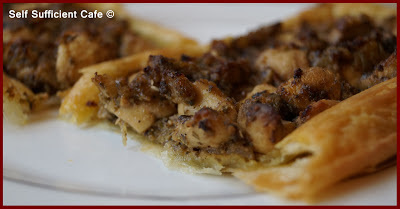 Be careful not to add too much Worcester Sauce or Olive Oil you don't want to make it too runny. The spread was perfect for a glorious sunny day (between showers). Both Mum and my sister thoroughly enjoyed it. No, the title doesn't mean I've been drunk and now sobered up! With all the fresh vegetables I bought on Wednesday I was excited about cooking tonight's tea. I randomly chose some vegetables from the fridge and decided to challenge myself to make something yummy. I was really pleased with the results. The vegetables I chose were, mushrooms, carrot, onion, celery, red pepper, green pepper, baby corn and courgette. 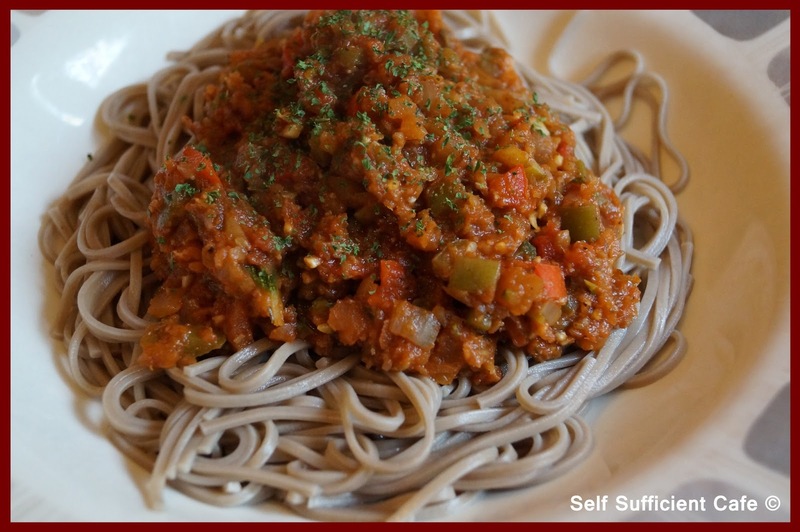 After looking at the vegetables for what seemed ages, I decided I was going to make a vegan version of spaghetti bolognaise, no fake meats allowed. To do this I needed to add some standard store cupboard ingredients, which were, Vegetable bouillon powder, chopped tomato, paprika, oregano, herbamore salt, pepper, tomato puree and garlic. 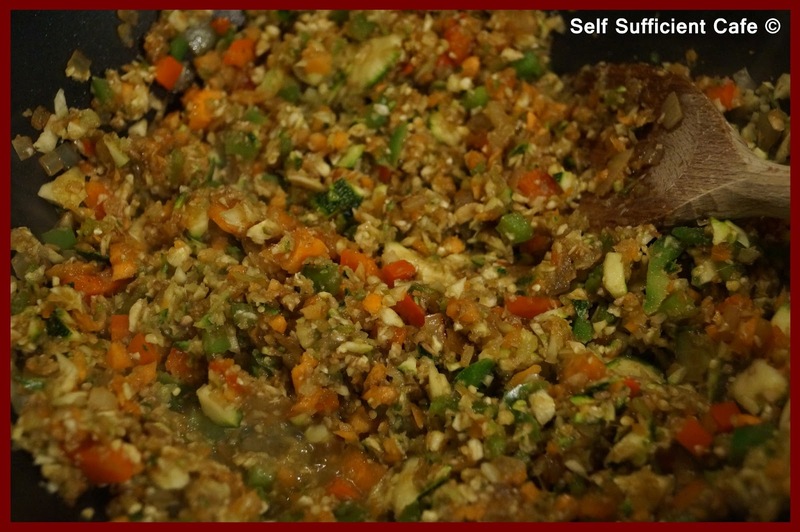 I finely diced the onion, garlic and most of the peppers and then through all the other vegetables into my trust food processor to chop up. I fried the onions in a little olive for about 5 minutes before adding the garlic and cooked for another two minutes before adding the chopped peppers and cooking for another 5 minutes. 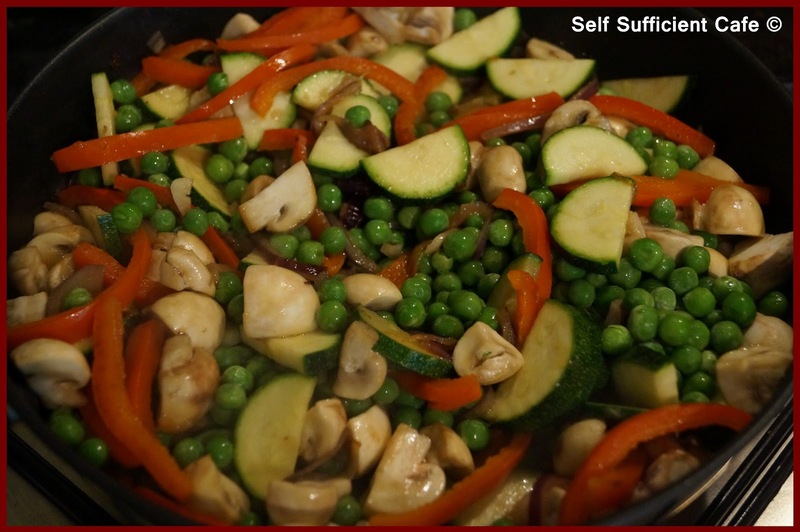 Then I added the processed vegetables to the pan and let them cook for another 5 minutes. 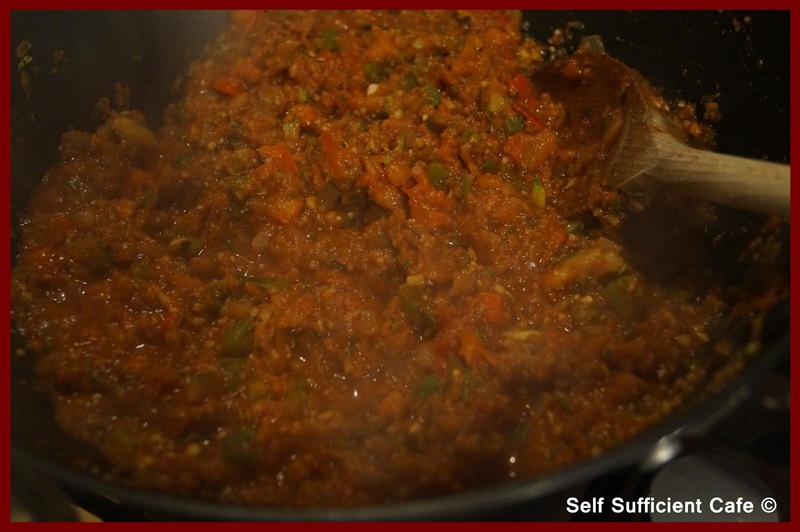 Next I added the chopped tomatoes and a little tomato passata and stirred to combine. 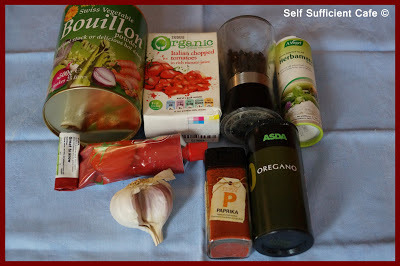 Next came the tomato puree, herbs and spices (including a pinch of chilli pepper), salt and pepper. I also added a little sugar, parsley and about a teaspoon of balsamic vinegar. I let this mixture simmer slowly whilst I boiled the soba noodles. After boiling the soba noodles for about 6 minutes drain and rinse with cold water, this will stop the cooking process. Pour into a dish and top with the veganiase sauce. Eat it up! Even though I say so myself this dish was amazing and one that I will make time and time again, it truly was delicious. It turned out far better than I'd hoped. Guess what? I went shopping on the way home from work, last night! What a massive chore that was. But on the plus side I picked up lots of fresh fruit and vegetables to cook some amazing dinners with. I'm quite excited to see what I come up with. To start things off though I want to showcase some of the fresh fruit I bought, it almost feels like summer is here. What better way to start the morning with a fresh fruit salad with some soy yoghurt drizzled over the top. I was getting fed up with smoothies for breakfast, well more fed up with washing out the blender if I'm honest! 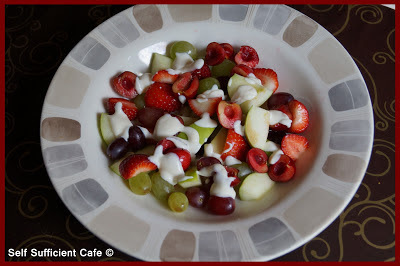 Today I preferred the fruit in its most natural form, and not blended up with vegetables. 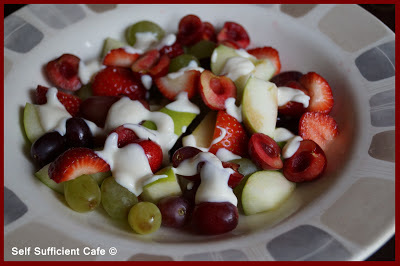 I chose a salad of apple, cherry, grape and strawberry and it was delicious. Yesterday I made a summer vegetable pie and I didn't quite use all the puff pastry. 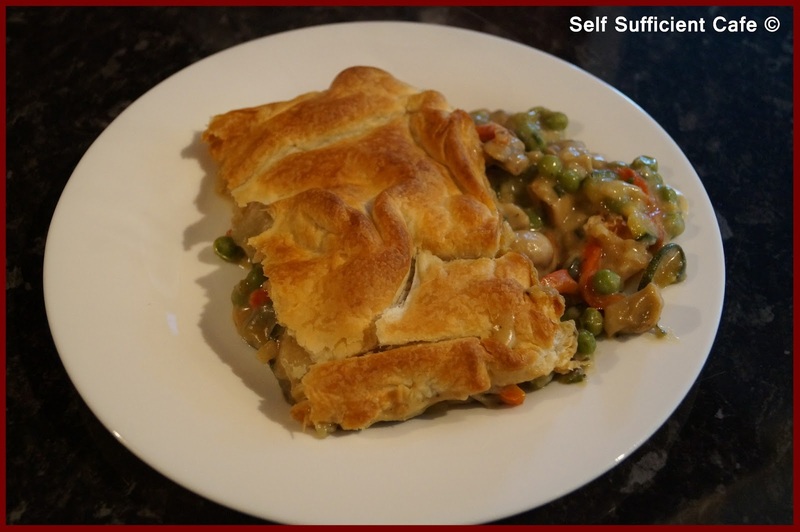 I thought I'd used half in the pie but it appears that I'd used most of it as there was only a quarter of the pastry left. I still had some mushrooms and a jar of vegan pesto that needed using up so tonight dinner was an easy decision. Mushroom tart. 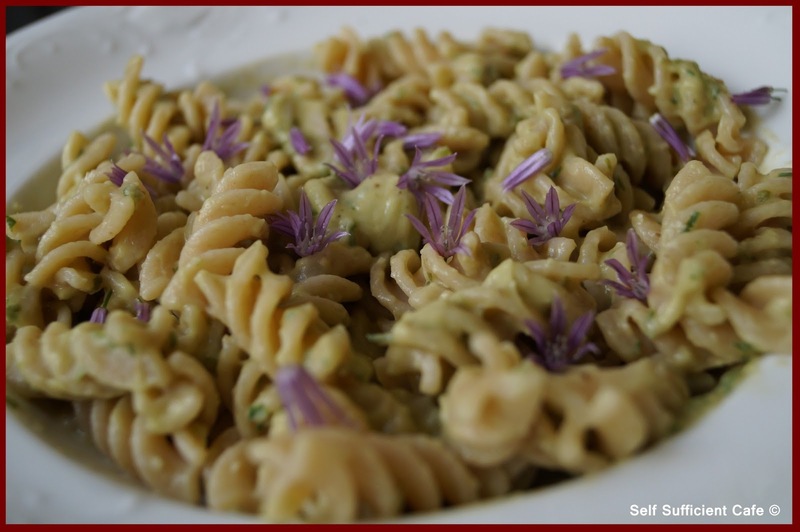 This is a very simple recipe that relies on a good quality vegan pesto, in this instance I used zest. I rolled the pastry out a little thinner to make the base for the tart and scored about a centimetre in from the edge all around. The inside rectangle I brushed on the vegan pesto and popped it in the oven to start cooking. After about 5 minutes remove from the oven and rest whilst you make the mushroom topping. To make the mushroom topping saute the onion in a little olive oil over a low heat, you don't want to brown the onion, just soften it. When the onion is translucent add the mushrooms and continue to cook for another 5 minutes, stirring regularly. Add the pesto and stir to combine, add the salt and pepper to taste and cook for another 2 minutes. Add the mushroom mixture to the middle rectangle of the pastry and put back in the oven to bake for about 10 minutes or until the pastry is golden. As I slid mine of the baking sheet it broke in half! It was still delicious though. 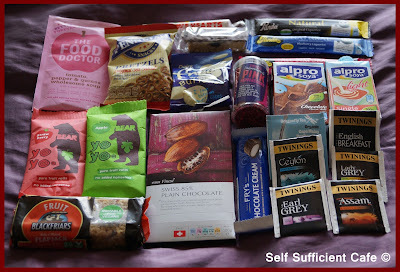 This is becoming a regular feature of my blog, no not vegetable pie, but the fact that I haven't shopped! I really need to get more organised. In fact in a conversation with my sister yesterday I was saying just that. I used to be the most organised person I knew, but this has lapsed a little. I need to start with going shopping and buy some fresh fruit and vegetables of all colours and then I will be in heaven cooking up some vegan magic! Anyhow, enough waffle, back to what I managed to magic up for tea. I'd told Hubby to pick something up for his dinner on the way home, so at least I hadn't got to magic up two dinners. I was pleasantly surprised when I saw in his shopping bag was a small bag of frozen peas and some mushrooms! After a quick check of my cupboards and fridge this is what I had. As you can see the courgette and red pepper were a little worse for wear and needed eating up! 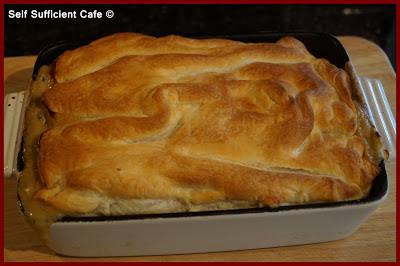 The pastry suggested that tonight's dinner would either be a tart, a puff or a pie. I went with the pie. 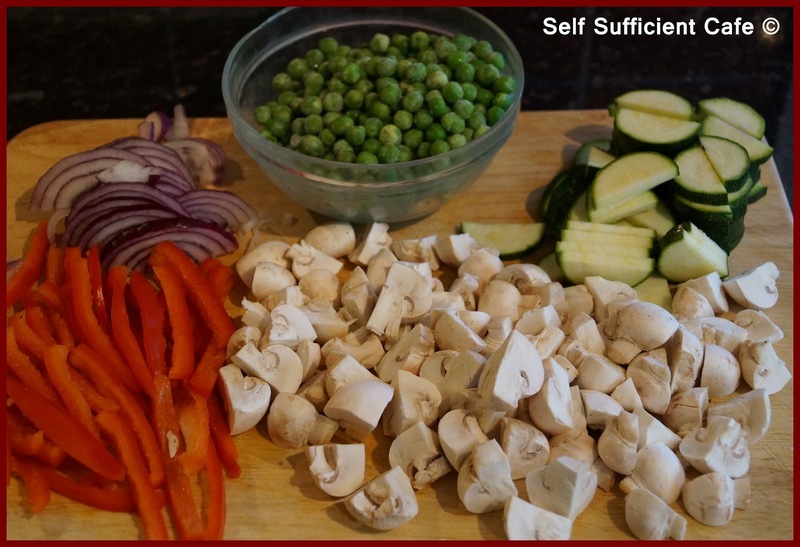 First I chopped up all the vegetables and measured out half the bag of frozen peas, after all I needed to leave some for Hubby! 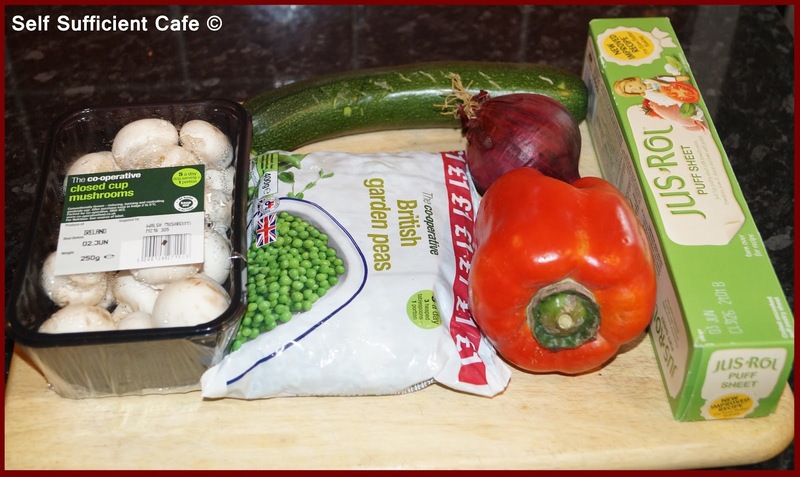 Next, saute the vegetables in a little olive oil, onions first, then peppers, mushrooms and courgettes. I added a clove of minced garlic too. I also added 4 shredded sage leaves, a rosemary sprig finely chopped and some thyme from my garden. Whilst the vegetables were cooking, I quickly made up a sauce. In a pan add soy milk, plain flour and vitalite (sorry didn't measure, just threw it in). 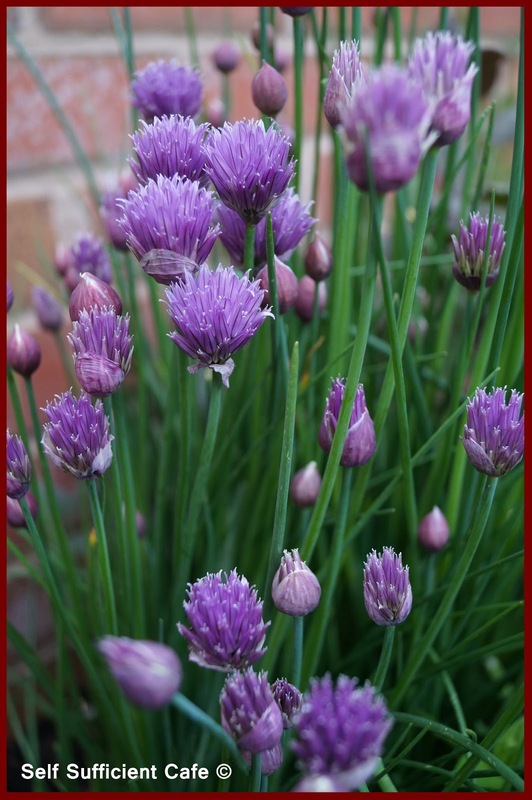 As it thickens add 3 tablespoons of nutritional yeast, a teaspoon of herbamare (a herbal seasoning salt), half a teaspoon of vegetable bouillon powder, freshly ground black pepper and about 10 chive stalks finely chopped. 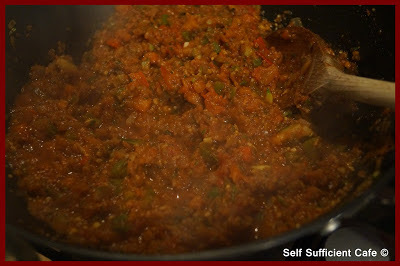 Add the sauce to the vegetables and stir through. Next, pour this mixture into an oven proof dish and top with the pastry. I only used half of the pastry so there's some more left for another day. Bake in a moderate oven for 20 minutes or until the pastry is golden. 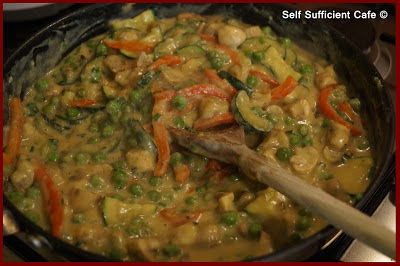 This made three good sized portions, if you were serving it with potato or chips you could easily make four servings. I ate my portion as it is, on its own. Today I helped celebrate a friends birthday and we went out for lunch. 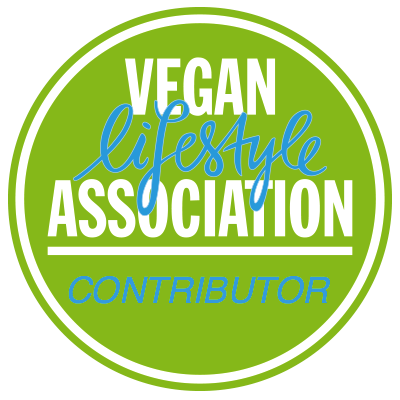 If you're a regular reader of my blog you'll already know that there is almost nowhere in my home town that caters for vegans! However, the more I ask and explore the more I uncover. My friend chose the venue and had asked about vegan options when the table was booked. We were eating out at a place which largely cooked burgers, not your regular fast food type but advertised home cooked. The menu was extensive for meat eaters and there were 5 options for vegetarians. I was pleasantly surprised when I was told that the vegetarian burgers were all vegan friendly and that the 'toppings' could be swapped to make the meal vegan friendly. To make sure, I emailed the manager and again he repeated what my friend had been told. Now I've been bitten once to often before, by people who don't really know what vegans eat and have suggested menu options of omelettes, cheesy dishes and even fish before now! So I decided to make extra sure. On arrival I asked the chef the same question and advised that the manager had told me that all 5 vegetarian burgers were vegan friendly. Its a good job I spoke to the chef, two of the vegetarian burgers contained egg! 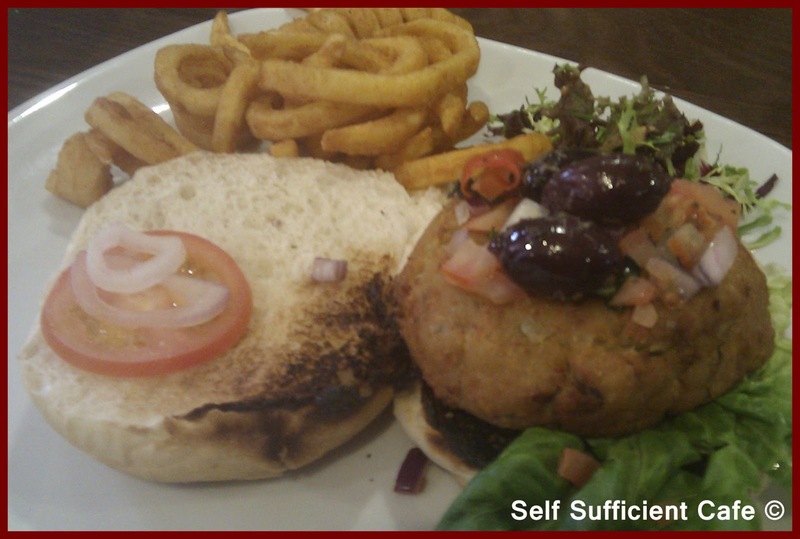 However the falafel burger and sweet potato and bean burger were indeed vegan. I ordered the falafal burger topped with basil salsa and black olives instead of the feta cheese. It was tasty, but the toppings were a little on the small side and they dressed the side salad of lettuce leaves with a vinaigrette which looked and smelt like it contained honey, so I left that. But overall it was nice to dine out somewhere different than the one other restaurant in town which caters for vegans. 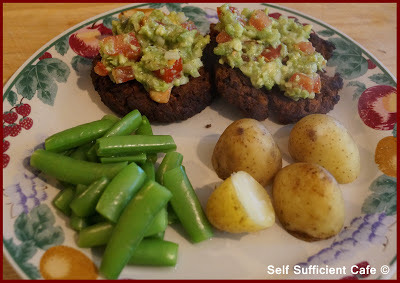 There's also another option I can try; sweet potato and bean burger, which I'll keep for the next birthday lunch outing. The meal filled me up so I won't be wanting much for tea! As you all know, I think my Mum is Superwoman! Whilst Hubby and I were ill she did so much for us both. So as I was feeling a little better I decided to make her lunch yesterday. Because we still haven't been shopping though I had to make something out of nothing! Once again, I raided my 'tardis like' store cupboards and came across a packet of falafel mix, which was way past its 'best before' date, but I figured it would be fine. I also came across a small tin of chick peas hiding at the back of the cupboard, so the protein side of lunch was sorted. Houmous and falafels, it was a shame I didn't have any parsley, because I could have made tabbouleh to go with it. 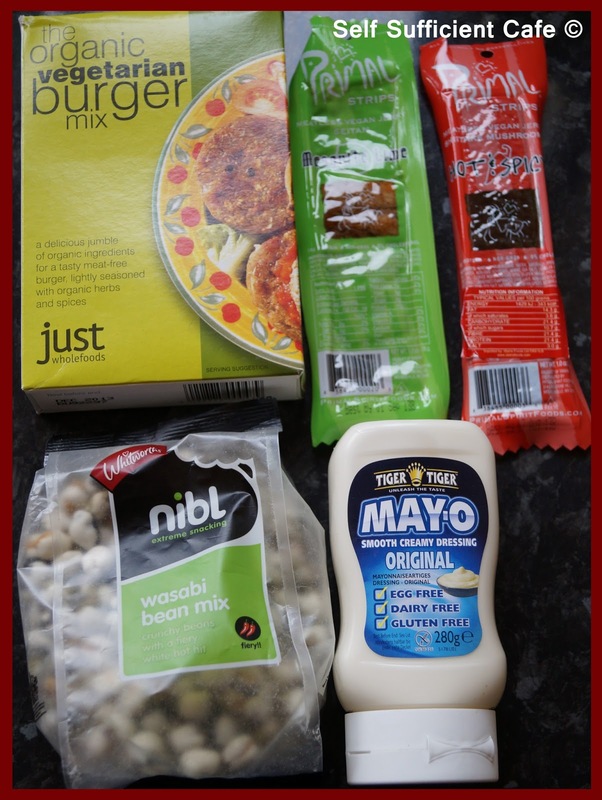 However, also hiding at the back was an old packet of Mediterranean couscous and after checking the ingredients were suitable, it soon became a part of the lunch. Plus, it was easy to rustle up. I also had some wholewheat pasta and an avocado so I made Angela's avocado pasta again, but used chives again instead of basil. To finish the lunch off I chopped up some beetroot and made a simple salad of chicory leaves, chopped spinach, cucumber and carrot ribbons and added a bowl of seeds to sprinkle over the top. 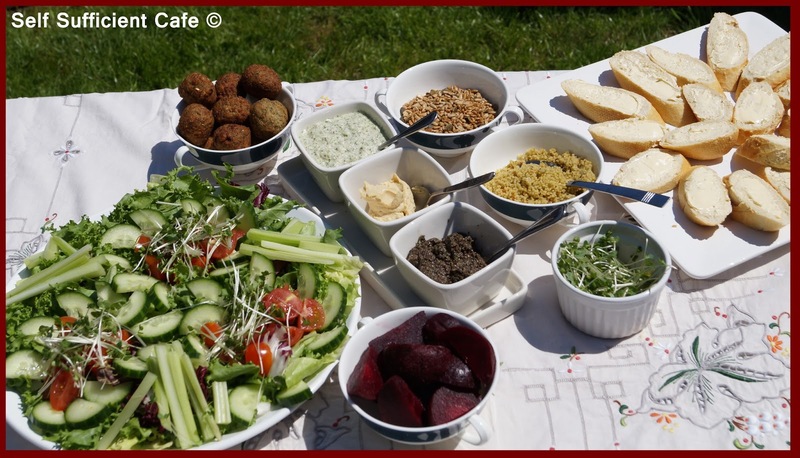 Mum really enjoyed the lunch, especially as it was her first all vegan lunch. Yep you've guessed it you haven't heard from me as I've been recovering from my illnesses. I needed rest and more rest. Thankfully today, I'm happy to report I am starting to feel a little better and I'm not so tired. These last three weeks have been rough to say the least! I tried and failed to go back to work last Monday, and after another doctors appointment to see how my chest infection and coldsore outbreak was and he signed me off for another week and gave me yet more antibiotics. Since then all I have done is sleep, sleep and sleep! It's just a quick post today to let you know I'm still here! I'll be back tomorrow with a quick food post. My Mum is coming round to check up on me (bless her) and I want to surprise her with a simple vegan lunch now I feel a little better. 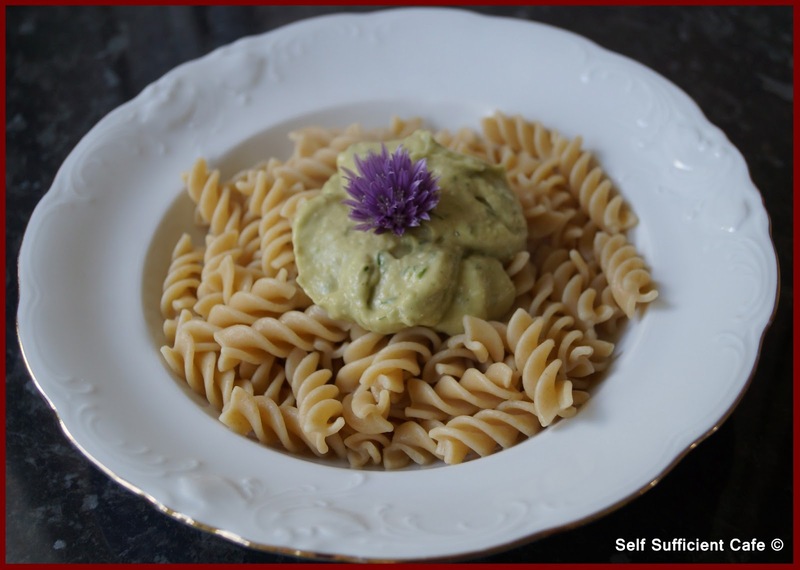 Today, I fancied pasta again for lunch and after a quick look what was in the fridge and a quick search through one of my favourite bloggers, oh she glows, I decided on Avocado Pasta. Angela, from oh she glows matches up avocado with basil for a rich creamy sauce, but I hadn't got any basil so I paired the avocado up with some chives. My garden is full of chives at the moment, I love the purple flowers bouncing around on their long green stems, they look so pretty. 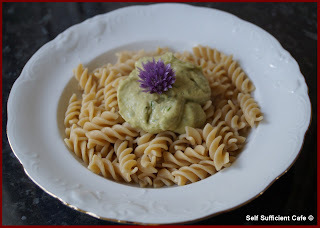 You really should try Angelas avocado pasta it really is delicious and super quick to make! Who else out there thinks there Mum is Superwoman? My Mum is the superwoman of all superwomen, she should wear a cape! Once again she came to our rescue, hubby and I are still poorly and haven't been shopping for almost two weeks. She arrived on our doorstep with a shepherds pie for hubby and a portion of my lentil and vegetable loaf, which I'd been storing in her freezer, for me. 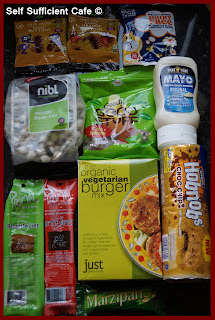 (No, we don't have a freezer, which is something I need to sort out, it would help so much in preparing and storing vegan meals for those nights when all you want is something quick and easy. 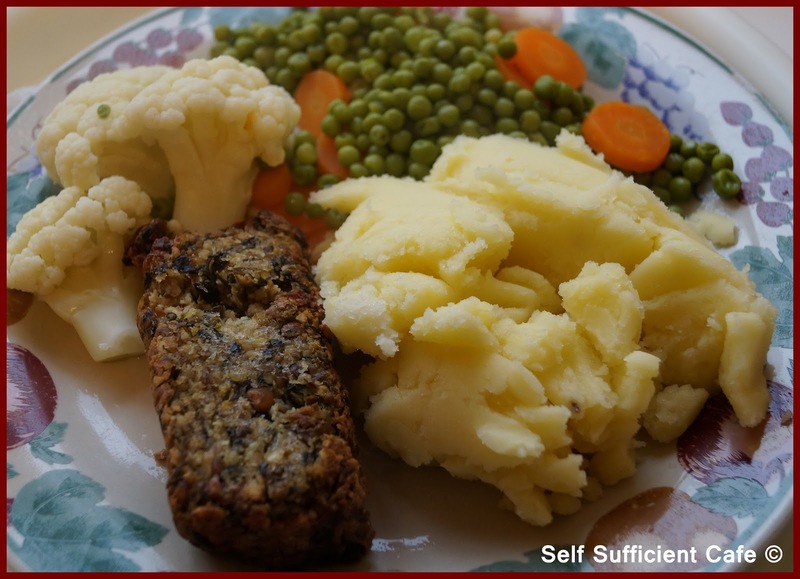 Instead of serving the lentil and vegetable loaf with Mediterranean vegetables or a salad (none of which we had) I served it with mashed potatoes using just vitalite (remember I don't have any non-dairy milk), carrots, peas and cauliflower. I did add a little marmite gravy but I forgot to take another picture, in fact it looked far too tasty to stop and take another photo! I wanted to dive straight in. So Mum Superwoman came to the rescue once again! What makes your Mum superwoman?